This week brought a strong group of comics. For New Comic Book Day, we continue catch up with The Punisher and Daredevil as a conflict comes to a head, jump into the new Suicide Squad series, continue reading Jeff Lemire’s incredible Black Hammer series, and check out Supergirl’s Rebirth. Remember, these are only a few of this week’s new releases be sure to check the TFAW website to see even more. We’d love to know what you think of these books too! 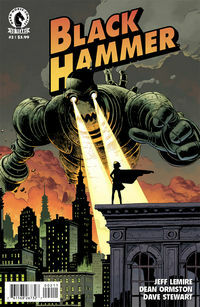 We last left Black Hammer with the whole team meeting up to reminisce their past lives with the hero (and their leader): the amazing Black Hammer. In this new issue we get to see a glimpse into the background of Gail Gibbons, aka Golden Gail, wherein she was given the gifts of the gods to fight to keep the world safe — or is it a curse? Now Gail, stuck in the body of a nine-year-old, is just trying so hard to get back the powers that she once felt burdened with. We also get to see Walky Talky and The Barbalien trying to get a probe outside the boundaries of the small town that they are trapped in. Also, we get to see a clash with one of their old foes, Doctor Sherlock Frankenstein (best name ever!). How will this “family” deal with all the troubles of trying to fit into the small town they’re stuck in, and what steps will they take to find their way home? Are they even in their universe, or are they in a pocket dimension? Could this be an elaborate trap by a villain from their past? 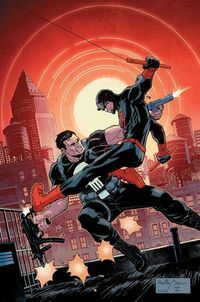 Daredevil Punisher #4 completes the “Seventh Circle” story, and it’s been a great ride. DD and Punisher have worked together in the past, but they’re at odds this time over a gangster named Sergey Antonov. D.A. Matt Murdock is transferring Antonov to Texas so he can get a fair trial, but Frank Castle thinks he needs to be punished for his crimes. For anyone who wants to learn more about Suicide Squad after the wonderfully fun movie, you should definitely grab a copy of Suicide Squad #1! 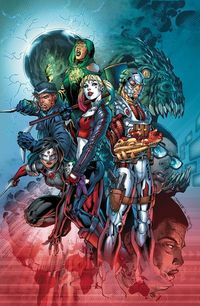 The story starts off with Amanda Waller’s inner monologue discussing why she assembled the Suicide Squad — she believes that bad can do good, and she’s . . . well . . . somewhat right! 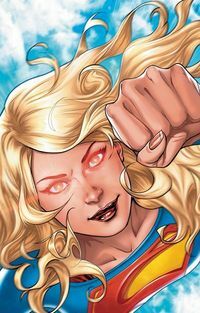 Supergirl Rebirth serves as a slingshot for those unfamiliar with Supergirl’s past and her place in the DC Universe. The issue starts with a flashback that establishes a potential threat (or possibly ally). In the new status quo that is the DC Rebirth, Supergirl only recently crash landed on Earth (like, a few months ago recent), and the D.E.O. is trying to make sure she becomes a hero like her cousin, Kal-El. They’ve assigned full-time handlers Eliza and Jeremiah Danvers to show her the ways of this planet and act as “parents” to her alter ego, Kara Danvers. I anticipate good things from writer Steve Orlando; we’re already seeing strong elements of a family drama for this series and I’m excited to see how Kara adapts to Earth and comes to understand our ways.